I've told you all before how much I enjoy my monthly "Box Of Awesome" from BespokePost.com. This month is no exception. Photos below from me, the description from the website. If you like a little surprise each month, try it out! This month we're laying out the ultimate spread. These select small-batch producers help you host the holidays or quell that late-night crave. Natural slate cheeseboard, complete with chalk! Sourced from a family quarry in upstate New York, this hand-cut, rough-edged slate slab provides a distinctive, rustic surface for serving your favorite cheeses and charcuterie. Clue your friends into what's what using the included soapstone chalk. Bread has met its match. Old Town Oil sources its products from the best vineyards. Manzanillo extra virgin olive oil balances classic olive flavors with a big finish. The Reserve balsamic is barrel-aged with the texture of honey, the complexity of a great single malt, and an unreal sweet tanginess. It's good on salads, meats and even strawberries. Punch up your spread. Spanish smoked paprika gives this okra a deep, zesty flavor. Eat it with salami or on its own, but whatever you do, don't throw out the brine. It can be used as a marinade or to concoct a spicy cocktail. Add some muscle to your meat. Salame Casalingo is this award-winning artisan shop's specialty. With subtle hints of salt and pepper, owner Cristiano Creminelli does not rely on heavy spices; it instead derives flavor from the heritage pork through his family's age-old curing process. 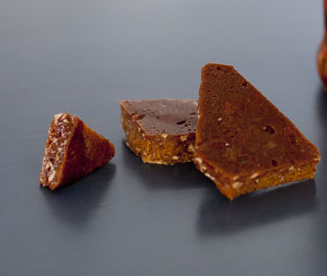 Smoky and sweet - a different take on traditional peanut brittle. The oldest continuously operating Bourbon distillery in America, Buffalo Trace produced during Prohibition in order to make whiskey for "medicinal purposes."